True Turnkey – Say goodbye to CDs, FTP charges, human error, and long fulfillment delays. Upload your high-res images to your account admin panel and all your orders can be automatically fulfilled in 1-2 business days (and used as backup, see #3). You can even use the “semi-automatic” mode to review and correct each order before it sends to print. Click here to learn more. Increasing gallery sales – From your galleries, you can now offer the ability to buy real wedding albums, parents albums, or brag books. Let the gallery visitors design and order, while we fulfill it automatically. Set up the album pricing and let the users and us do the rest. You can take advantage of this service even if you fulfill your print orders yourself and you do not have to change your plan. Secure backup – Get secure cloud back up for your gallery images. All high-res files uploaded through the admin panel can be used for automatic fulfillment, as well as receiving free secure back up for a year. Powered by Amazon Cloud, you can retrieve them any time form anywhere. After a year, you can choose to remove them or keep them backed up for a small fee. Click here to learn more. All of the above services are offered under your current plan. We’re happy to help you get started using any of the above features, so don’t hesitate to call us if you have any questions at 1-866-DIGI-LAB. Simplify your life, work less, and earn more. This entry was posted in DigiLabs Technologies and tagged amazon back up, Photo Sharing, Photography, Web Galleries on June 17, 2014 by digilabsprowp. If you’re not sure were the title of this blog posts comes from, take a look at this video. Fascinating as it is, this post will not deal with matchmaking but with color matching. No, not matching you shirt with your jacket…the “other color” matching. Basically, how do we match the color we see in one place with the color in/on another. For example, you want your company logo red the same color, no matter where it is printed. Otherwise, why did you pay gazillions to those corporate identity guys? You want it to be the same red on your web site, your power point presentations, your brochures, your magazine ads, and even on the billboard near the highway…so you see it every time you drive back from the office at 8.00 PM. The problem is, how can you make all those reds match? Heck, your logo may have other colors in it. You want all of them to match. That is “the other” color matching, and it is not as simple as it sounds. This post will just layout the ground and show why this problem is a real hairy one. The next post will discuss what can be done about it. The first thing we need to discuss is color. What is color and what is color made of? We have a light source, let’s say the sun. This light source omits numerous waves of energy, each having different wavelengths. All of them combined together look like a white light (although some of the frequencies are not in the visible range, such as Ultra Violet (UV) or Infra Red (IR)). This light hits the surface on an object, for example a red apple. The surface absorbs some of the frequencies and reflects the rest. In our case it reflects the waves that are in the red range. Those waves get to our eyes and hit some sensors that can interpret those frequencies as red, green, or blue. This information pass through our optic nerve into our brain and creates the perception of color. This is called a Subtractive Color model – as the frequencies that are not absorbed form the color we see. We also have the Additive Color model, where we project different frequencies, adding them together to create the color. Printed color is subtractive, while projected color (TV, monitor) is sdditive. So if color is light, what is color where there is no light? Is the apple red but we just can’t see it or is the apple something else? This may be a philosophical question, but also a very practical one. My logo’s red is going to look different under different light conditions. Since red is an attribute of the light it reflects, the same red will look different on noon in an Arizona’s summer than noon in a Seattle winter. It will actually look different based on the type of light, be it the hour of the day, weather, lighting conditions or even our latitude and longitude…you name it. So what we have here is a real problem of definition. We need to agree on the environment we are going verify that the colors match. The second variable is the reflective surface. Some frequencies will be absorbed buy the surface while others will be reflected – this gives our brain the perception of color. We do that by spreading ink on the surface. However the surface participates in the process. Printing on a white paper will give different results than printing on black paper. And as anyone who painted their house with some white variation knows, not all whites are created equal. This way of defining color adds limitations. Wave length or frequencies are analog, and they are continues and infinite. In other words, you have infinite combinations that can represent color. But the way we try to represent color is digital. Lets take RGB – if each color channel can have 255 values, the total number of colors we can represent in the RGB model is 16,581,375. This sounds like a lot, but it is still less than infinity and we need to decide what colors will we use these values. Also, not all color models are compatible. We can define some colors in one color space that we can not define in another. 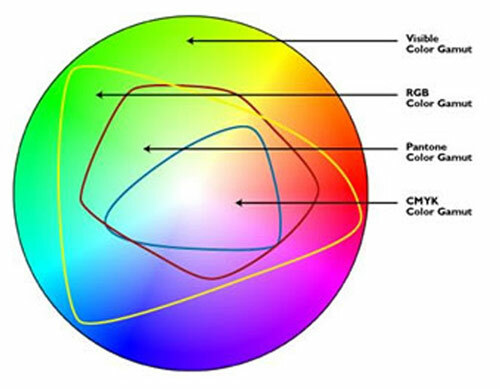 See the following image to see the different color space range. Lastly, we have to consider that eventually we will use a mechanical device to print or project a color. Those devices do have limitations. They can not produce the full color gamut. So, not only can we not define all colors, but we can not produce all the colors we can define. Even worse, this is difference in devices causes different colors to be produced differently. Below, see an example of a TV viewable gamut. To sum it up, color is a variable of light and light conditions which vary. Its production depends on the material used to produce it and on what we produce it on. We can not define all colors. We can not print all colors, and each machine can print a different set of colors. With such a mess it is a miracle we can print color at all. Next time we will discuss: How can we make your red logo colors match? Looks like we can look forward to more to come on this color conversation. Thanks to our CTO for sharing with us and can’t wait to hear how to match color! 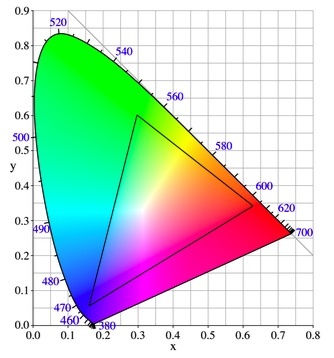 Don’t forget, if you’re concerned about color calibration DigiLabs is here to help. We have a Support team available by email and phone who can discuss your color matching issues with you. We also send you a start up kit when you sign up with DigiLabs with samples and offer discounts on all your first orders to make sure you are happy with the color output you submitted. Read more here. This entry was posted in DigiLabs Technologies and tagged color, professional photography, Support on May 11, 2010 by DigiLabs Pro Blogger.